Miles Nielsen performing in "The Hallowed Hall" on Oct. 11, 2018, in Bloomington. Karen Bridges from Stone & Snow calls it a "microvenue." Bloomington-Normal musicians continue to create new ways to promote their events and are even creating new venues for performances. Singer-songwriter Sara Quah is collaborating with Bloomington artist Jan Brandt to promote her show at Nightshop Saturday night. Karen Bridges and Clint Thomson are collaborating with a Bloomington print and design studio to create a new intimate venue. NPR’s All Songs Considered blog said "if Florence + The Machine made folk music, it might sound a little like Stone & Snow." That’s quite a compliment for the Bloomington duo of Bridges and Thomson, who play regularly around central Illinois. Two years ago, they and the owners of Duncan Manor outside Towanda created the highly popular Songwriter Series that ran two winter seasons. So they worked out a deal with Half Hazard Press (HHP) in downtown Bloomington. The design firm that already has a strong reputation with local, regional, and national musicians for creating stunning posters and artwork opened doors to its new location in 2017. Bridges said HHP was very open to creating a vibe at their shop similar to the Songwriter Series at Duncan Manor. Bridges said each event in what they call “The Hallowed Hall” is designed as an intimate affair where the artist can banter with audience members in a setup that has the feel of a living room. She said they try to create an atmosphere where the show is an experience from beginning to end. Bridges says The Hallowed Hall fits well into the live local music scene featuring original music that includes the Castle Theatre, Nightshop, Jazz UpFront, and Six Strings Club. "The Hallowed Hall is kind of a microvenue. We're offering something a little bit different." Unlike the Duncan Manor Songwriter Series, Bridges and Thomson are targeting songwriters with a regional and even national reputation to play The Hallowed Hall. “So we try to leverage our own contacts and maybe Half Hazard’s contacts through their work. And maybe some people who play here on occasion, even at the bigger venues but want to do something on an off-year or day where it doesn’t really fit for them to be at the Castle or Nightshop,” said Bridges. The Duncan Manor Songwriter Series was a smashing success, selling out most shows well in advance. But Bridges and Thomson knew they wanted to partner with a local business if the series was to continue in a new space. They learned music fans came to shows at Duncan Manor to experience the unique building out on the prairie as much as they did the music. Bridges and Thomson hunched HHP’s design reputation would create an extra incentive to buy tickets for the Hallowed Hall shows. Poster for Sara Quah's Nov 17 concert at Nightshop. 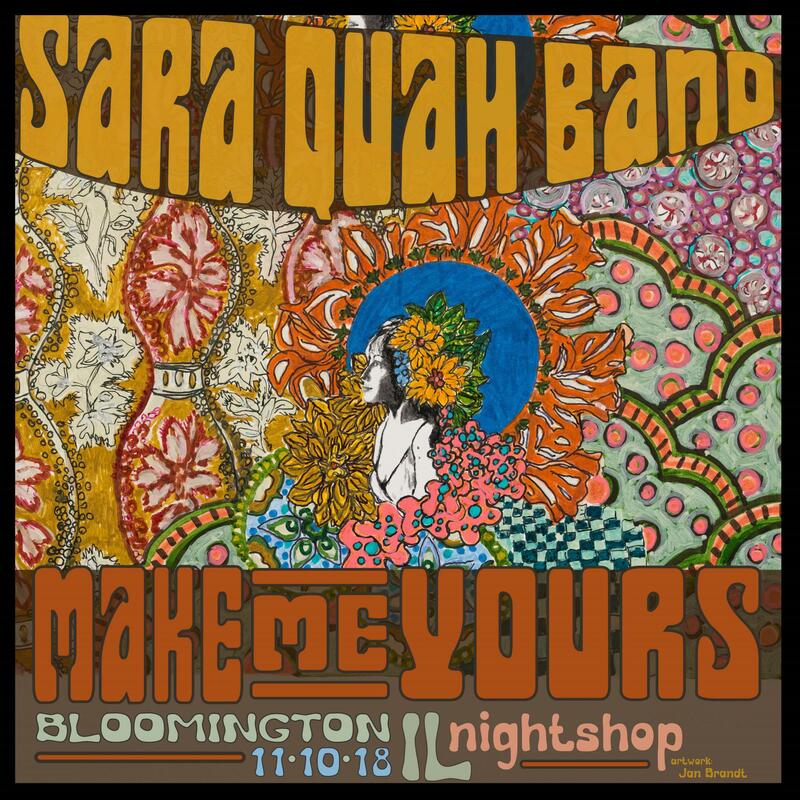 “Make Me Yours is the brand new single by Bloomington singer-songwriter Sara Quah. She too is collaborating with a local artist for her Nov. 10 show at Nightshop, where she debuts the single. Jan Brandt has created a poster for the event that merges the spirit of the Fillmore East concerts in the 1960s and 70s with the work of Czech painter, illustrator and graphic artist Alphonse Mucha. Quah is bullish on the Bloomington-Normal music scene, but acknowledges especially non-listening room venues such as bars and restaurants, (and even some listening rooms) struggle to attract an audience on weeknights. Many are busy toting kids to sporting or music events; others enjoy a night with Netflix or other online distractions. So Quah is digging into new ideas. “Everyone will say, ‘What kind of community do you want to live in?’” asked Quah. “And I ask that question a lot. Everyone will say, ‘I just want a place where there is a lot going on … I want friends, I want connections.' Yet when it comes down to it, they don’t go out. I get it, sometimes I want to stay home too. But in order to create that kind of community, you have to be a part of it and support local businesses." So Quah is hoping Brandt’s limited-edition poster acts as an incentive for fans to buy tickets for the show, and hopefully her new single. And she’s banking that her partnership with Brandt will allow both to mine each other’s demographic—similar to how Stone and Snow and Half Hazard Press leverage each other’s reach on The Hallowed Hall shows. Quah said it’s a natural connection, as Brandt already has her own following in town. Brandt is somewhat altruistic about this project with Quah, as she is a music fan in general and especially of Quah’s. But she’s also a maverick of sorts; she unabashedly uses nontraditional platforms for her art. “Perhaps one of my large paintings might be too expensive for someone to purchase, or they don’t have a place for it. But that doesn’t mean I’m going to knock them out of the equation. I’m going to have different price points and make it more democratic to try to get people in our entry levels for collecting art and from there it starts to grow. I also work with other companies to add my artwork as designs to printed products. I have a yoga clothing line, tote bags, even glassware,” said Brandt. She said purists might tut-tut her for “selling out” by putting her artwork on commercial items, but Brandt views herself as an individualist. And as someone who went back to school in her 50s, she’s not concerned what others might think. “I’m friends with a lot of my professors, and almost all of them are totally supportive (of her marketing approach). They’re like, ‘If I’m happy with it and it’s a good quality product, then go for it.’ But also, nobody has really been able to tell me what to do when it comes to my own decisions,” laughed Brandt. Brandt, like Sara Quah, is bullish on the Bloomington-Normal music scene. And though working with Quah can help her artwork reach a new audience, she directs the conversation back to altruism. Collaborating with another business in town to help promote a show, or with a venue to create a more welcoming atmosphere for the show itself, isn’t THE answer to a more vibrant music scene. But it’s one way Bloomington-Normal musicians are working to sustain that thriving scene. Sara Quah's show at Nightshop is Nov. 10. You can buy tickets at brownpapertickets.com where you'll have an array of choices to purchase Jan Brandt's poster and/or Quah's new single along with tickets. The next show at The Hallowed Hall at Half Hazard Press is Nov. 17 with Belleville bluegrass band Old Salt Union. Tickets that include a commemorative poster can be purchased through the Hallowed Hall Facebook page. Jenae Thomason was flashing back to June 30, the Saturday night she and husband Jay simultaneously were rear-ended at a stoplight en route to a private event and sidelined from their full-time foray into music they initiated just weeks prior. On the pleasure/pain continuum, Karen Bridges and Clint Thomson of the Bloomington-Normal folk duo "Stone & Snow" concede the latter often wins out.